Whether the two central banks on either side of the NZD/USD currency pair change their message or tone over the coming period, or not, stands to have a major bearing on the future direction of the NZD/USD exchange rate from its 0.6500 level. A continuation of the current US Federal Reserve’s monetary policy tightening stance, where Governor Jay Powell ponders that it may be necessary to increase their interest rates beyond the 3.00% neutral point, would see the US dollar remaining at its stronger level. However, just a hint of a back-track from that monetary tightening stance would cause US dollar selling in global FX markets and thus an opportunity for the Kiwi to further recover to 0.6700 and 0.6800. To date there have been no soothing words from the Fed and they remain on track for a fourth rate hike this year and another three next year. A continuation of the US share market sell-off (the Dow Jones Index is down 7.5% in October from its record highs of 28,800) to the point where it adversely impacts on US business and consumer confidence. We are a long way from that position today, however there is speculation as to how severe the plunge in share values would have to be before the Fed are forced to shift on their interest rate stance. 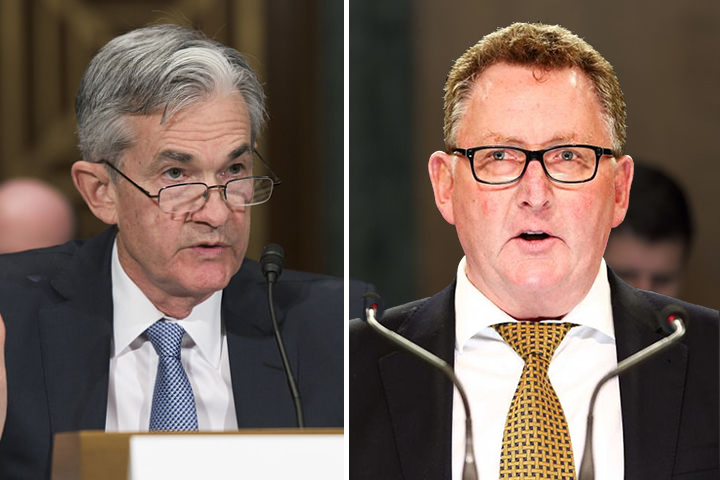 A number of commentators suggest that somewhere between a 20% and 30% fall over a relatively short period would prompt the Fed to express concern about the share market crash negatively impacting on the wider US and international economies. Rising US interest rates, a stronger US dollar value, higher oil prices, import tariffs and the trade wars are cited as reasons for investors dumping shares as they see US listed company profitability falling short of expectations implied in stock valuations. US economic data proving to be weaker than Federal Reserve forecasts and expectations. GDP growth for the September quarter was in line with prior forecasts of 3.5% pa (quarterly increase annualised). Consumer spending and services remain at robust levels in the US economy, however worryingly for some, business investment and manufacturing activity are starting to fall away. Further evidence in upcoming economic numbers that the Trump-led trade wars are hurting large parts of the economy will certainly cause the financial markets to price-in a change in the Fed’s monetary stance. Consensus forecasts are for a 190,000 increase in jobs over October (released Friday 2 November), a result well short of that figure will be negative for the USD. President Trump’s policy shifts with tax cuts, decreased environmental regulations and increased Government spending have been very positive for both Wall Street and Main Street America to date. Starting a trade war with import tariffs is a policy that may well undo all those positives. The sell-off in the equity markets over recent weeks may be telling us this already. The investment and financial markets are not yet focusing on the “elephant in the room” issue for 2019, the blow-out in the US Government budget deficit and ballooning debt levels. When the FX markets move away from US interest rate increases driving the stronger US dollar, the US fiscal deficit increasing dramatically from 2% of GDP to over 5% will be a reason for a weaker US dollar. One of the factors behind the depreciation of the Kiwi dollar to 0.6500 has been the RBNZ adopting a more dovish monetary policy outlook over recent months. With both NZ inflation and GDP growth tracking well above recent RBNZ forecasts, there will considerable FX market interest in the RBNZ’s next Monetary Policy Statement on the 8th of November. While global economic, investment market and geo-political risks have arguably increased since their August statement, the RBNZ will not be able to ignore the local economic data being much stronger than what they were anticipating. They will be forced by the data to revise their inflation forecasts higher, therefore it will be impossible for them to maintain their overtly dovish tone of recent statements. Even a marginally less dovish statement from Governor Adrian Orr on 8 November should be a positive for the over-sold Kiwi dollar. The NZD/USD exchange rate has so far failed to break up through the technical resistance level of 0.6600. It will require a weaker USD against the Euro to push the Kiwi higher in the short-term. The Italian government budget stand-off with the EU has been a negative for the Euro over recent weeks and this has prevented the USD from weakening. Credit rating agency Standard & Poor’s have not downgraded Italy’s BBB sovereign rating; therefore, the Euro should recover from its recent sell-off to below $1.1400. 'Also, keep an eye on the Chinese yuan as it approaches the 7-to--the-greenback level. Official manipulation and market speculation are battling each other and commodity currencies like the NZ dollar may be at risk of being collateral damage.' (D. Chaston). I'm going to stick with Mr Chaston on this and hold my view that we may be rallying to a lower low, rather than the 68 cents mark. It could go in any direction from here. And I remain unconvinced we don't quite know where here is. You're right Nic, watching the 'home team's next move will be interesting. Perhaps Mr T & Mr Xi will kiss & make up? Funny, I can't see any evidence in that NZD/USD chart of a change in trend. I guess it must turn up at some point, so eventually Roger will get it right. Happy to see that the message from Mr Kerr has changed to "it might move up, dependent on other factors", which is a strong change from "it will be moving up very soon based on these factors". Next up, "it might move down based on these other factors".